Hikvision has taken the initiative and once again moved the benchmark higher. 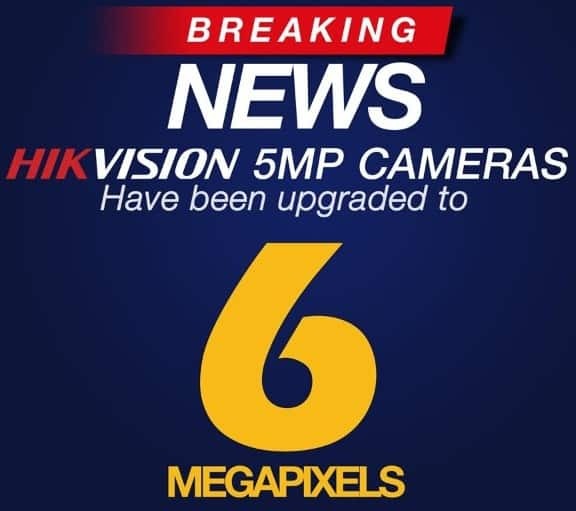 Using their 5MP cameras we are now able to upgrade the resolution to 6MP. The main reason was to increase the viewing angle with a 2.8mm lens. The old 4MP cameras had a viewing angle of 106 degrees. Unfortunately when the 5MP cameras were released this dropped to 81 degrees making it difficult to give you full video coverage when the camera was positioned in a corner. Now with 6MP the angle has jumped up to 97 degrees! If you are looking for a CCTV system or security cameras please don’t hesitate to contact us! PS: Their 8MP cameras are 102 degrees.